Making music, mixing beats, tweaking demo tapes—if you do any of these on your computer you'll want to give the S-DJ05's a listen. A pair of pro-quality speakers for serious studio work. 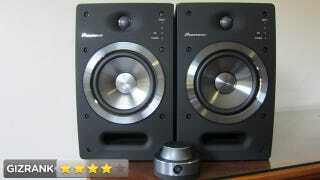 DJ's, music producers hoping to be the next Kanye West and need some solid monitors to compensate for their tin ears. They're as heavy as they are gorgeous—nearly thirty back-throwing pounds for the pair. The 5in woofer and 2.5cm tweeter run independently and are driven by a 10cm high-force magnet. The curved waveguide of the speakers is designed to spread the sound so it's the same regardless of where you're standing in the room. Set up is a breeze—just plug-and-play (they are just speakers after all). These include four input jacks: one XLR, one 1/4 inch TRS, and two RCA's so you can hook them to an EQ board or directly to your computer. They're precise enough to clearly hear Bonham's squeaky kick-drum pedal on Since I've Been Loving You and powerful enough to crank Battering Ram at 11 without any noticeable distortion. These are $900 computer speakers. If your studio isn't paying for them, be warned: no amount of high quality playback will tighten up your sloppy rhymes, so spend wisely. Each speaker is actually independently powered. Control knob takes a little getting used to but way easier to learn than the BMW iDrive. Also available with an 8" woofer. If you have the need for studio-quality monitors, absolutely. • Dimensions: 7.28" x 11.85" x 10.16"